It’s not About the City, It’s About the People. When I moved to Vancouver, almost 7 years ago, the city Vancouver enticed me with sunny restaurant patios, seaside bike trails, hip coffee culture, bountiful farmers markets, snow capped mountain window views and pretty much the coolest, hippest people ever. I remember feeling so certain that the city of Vancouver was our destiny shortly after my husband and I got home after spending a year in Seoul, teaching. There was just so much life and culture in the city to be taken advantage of, so we did everything we could to get there fast. We signed a lease for a place on Commercial Drive and I remember feeling surprised because neither my husband nor I had jobs at that time. We got quickly acquainted with the various characters on The Drive, as we meandered the streets at night, in search of fresh produce, live music and a good cheap beer. Fast forward 7 years later, my husband and I are still Vancouver lifers, now with two young kids of our own. Now our Saturday mornings are not spent finding the best brunch spot, rather we spend our free time finding free/cheap kid-friendly weekend activities. But this story is not about us, it’s about what we’ve come to love about the great/sometimes not-so-great city we’ve called home for almost a decade. Let’s start with the Vancouver landscape. I’ve never tired of the mountain views and close proximity to some geographical gems. One thing I’ve learned to appreciate over the years is our Vancouver parks. Most of us Vancouver residents don’t have large backyards to enjoy, and when you have children of your own, you learn to appreciate the necessity of outside space. One of our favourite city parks is New Brighton, (great ocean views, captivating beach/sea life, large field, functional playground, general feeling of peacefulness and an outdoor swimming pool to boot).In the 5 Vancouver homes we’ve lived in, all of them were walking distance from parks, playgrounds and fields. Being able to walk to the park is one of many things I am grateful for in this city. Walking as a mode of transportation brings me back to my childhood days, growing up in a small town and getting things done on foot or by bicycle. 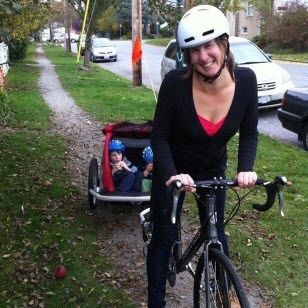 We decided to go car-free in Vancouver for 6 months, around the time when we had a 2 year old and a newborn (actually we didn’t own a vehicle when I went into labor with our second child). In any case, not having a vehicle didn’t prevent us from doing all the things we wanted and needed to do. Vancouver has a lot of great transit options, but with public transit there are never a shortage of challenges. I remember waiting to catch the bus with our newborn and our 2 year old, feeling excited to take our son to his first dance class. I decided to use public transit and unfortunately because of the busy route, about 3 buses turned us away because I wasn’t able to fold up the stroller and schlep the baby and the toddler onto the bus. I cried because I really didn’t want my son to miss his first dance class and I was crushed by the reality that the Vancouver Transit System sometimes fails us. We later discovered that the aquabus in South False Creek was a much more leisurely transit option, and it took us right to Granville Island, where the dance class was held. I’ve heard it said that the city is our backyard, and I believe this to be true of Vancouver. Also, when we share space with our neighbours, community happens. I’ve gotten to the place in my life where my neighbours have become my friends. I count this as a real blessing in our life, as not everyone can say that their neighbours are their friends. These friendships started out by asking for a cup of sugar and an egg, and followed by kid play dates at our local playground. Then real conversations began to take place. In sharing openly and in supporting one another, true friendships began to blossom. Some friends from Vancouver were leaving on a trip to Ontario and they offered their vehicle to us, on the same day my water broke. Our friend, a neighbor from down the hall, slept on our couch all night when I went into labor with our second child and we had to go to the hospital. I truly believe that Vancouver is filled with some of the brightest and emotionally connected people, some of these people are our neighbours and some are connected to us through other parent and friend circles. A neighbourhood house I attend has become a weekly haven for my kids and I. It’s a god-send to be able to send my kids upstairs at the Neighbourhood House, to be cared for by loving and caring staff members, while I get to discuss and learn more about parenting for 2 hours, kid-free and at no cost. Oh, and I get to drink coffee in peace. Community is an important value that I’ve held onto since I was young (growing up in a small town in the South Okanagan). It always surprises me the high level and the importance of community I’ve found in the city of Vancouver. A vivid and strong collection of memories that I hold onto is the 2010 Vancouver Olympics. My husband and I went to a downtown pub to catch the infamous Canada vs US Gold medal hockey game. I’ve never been high-fived so much in my entire life. There were ongoing verses of “Oh Canada” being sung, pre-game street hockey games being played and a general positive vibe in the air. I got that same feeling of camaraderie when the Vancouver Canucks made it to the final round of the Stanley Cup. We gathered with friends to watch the games being broadcasted every week, enthusiastically celebrating every goal and win and crying when our team lost in the end. It’s moments like these that remind me what I love about the city of Vancouver. It’s not just about the city itself, it’s about the people who live here, many of which I call good friends.